It is possible to find scarce metals in a variety of everyday objects. These materials are difficult to extract and recycle and are extremely rare such that several of them have become "conflict minerals" capable of promoting oppression and conflicts. 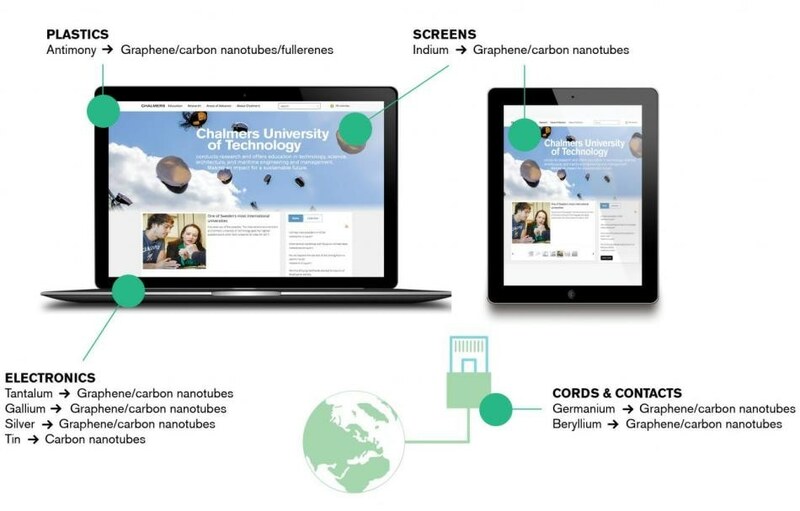 A survey at Chalmers University of Technology currently demonstrates the existence of technology-based solutions that have the potential to replace many of the metals with carbon nanomaterials, such as graphene. These scarce metals can be found in mobile phones, computers and in most of the electronic equipment and also in a number of the plastics that can commonly be found. Society is majorly dependent on scarce metals, and this dependence has a number of disadvantages. Scarce metals such as indium, tungsten, silver and tin are both difficult and rare to extract since the workable concentrations are extremely small. This guarantees that the metals are in great demand - and their extraction is a breeding ground for conflicts, such as in the Democratic Republic of the Congo where they indeed fund armed conflicts. They are also difficult to recycle profitably as they are frequently found in small quantities in different components such as electronics. An alternative solution, substituting carbon nanomaterials for the scarce metals, has now been examined by Rickard Arvidsson and Björn Sandén, Researchers in environmental systems analysis at Chalmers University of Technology. These substances - the most popular of which is graphene – are tough materials with good conductivity, just like scarce metals. Now technology development has allowed us to make greater use of the common element carbon. Today there are many new carbon nanomaterials with similar properties to metals. It's a welcome new track, and it's important to invest in both the recycling and substitution of scarce metals from now on. The main applications of 14 different metals have been studied by the Chalmers Researchers, and by reviewing scientific and patents literature they have explored the potential for replacing them by carbon nanomaterials. The findings provide an exceptional overview of research and technology development in the field. Arvidsson and Sandén highlights that the summary depicts that a shift away from the use of scarce metals to carbon nanomaterials has already started. There are potential technology-based solutions for replacing 13 out of the 14 metals by carbon nanomaterials in their most common applications. The technology development is at different stages for different metals and applications, but in some cases such as indium and gallium, the results are very promising. "This offers hope," says Sandén. "In the debate on resource constraints, circular economy and society's handling of materials, the focus has long been on recycling and reuse. Substitution is a potential alternative that has not been explored to the same extent and as the resource issues become more pressing, we now have more tools to work with." Recently, the research findings were published in the Journal of Cleaner Production. Arvidsson and Sandén highlight that there are major potential benefits from decreasing the use of scarce metals, and they believe this will indeed strengthen the case for more research and development in the field. "Imagine being able to replace scarce metals with carbon," Sandén says. "Extracting the carbon from biomass would create a natural cycle." Since carbon is such a common and readily available material, it would also be possible to reduce the conflicts and geopolitical problems associated with these metals. Simultenously, the Researchers also point out that increased research is required to deal with any new problems that could rise due to the replacement of the scarce metals. "Carbon nanomaterials are only a relatively recent discovery, and so far knowledge is limited about their environmental impact from a life-cycle perspective. But generally there seems to be a potential for a low environmental impact," Arvidsson says. Carbon nanomaterials consist mainly or solely of carbon, and are sturdy materials with good conductivity. A number of these scarce metals have similar properties. The metals are found, for instance, in capacitors, corrosion protection, flame-retardants, flame-retardants and cables. Rickard Arvidsson and Björn Sandén at Chalmers University of Technology have explored whether the carbon nanomaterials graphene, carbon nanotubes and fullerenes are capable of replacing 14 scarce metals in their key areas of application. They discovered potential technology-based solutions for replacing the metals with carbon nanomaterials for all applications except for gold present in jewelry. Silver, beryllium, gallium and indium are the metals which were closest to being able to substitute.